Target Dashboard is all about the effective visualisation of data. One way that you can display your data and immediately get an overview of historical data and trend, is through a comparison chart. This type of chart can be very useful in many different areas of business, such as sales, HR, service desk and finance. It allows you to spot recurring dips or rises in your data, year on year. This helps you predict and counteract such events in the future directly on your KPI Dashboard. In a chart such as the one below, that covers a time period that spans several years, it can be difficult to spot seasonal trends and compare one year to another. With a comparison chart, you can get a much better overview of your data. You can compare 2 or more years, and easily discover trends in your figures. In Target Dashboard,you can create a chart such as the one above by going to your dashboard and clicking on Add Other Item. Select the comparison chart, and begin putting your chart together. In the chart designer, you can pick your data table, select the column that you want to chart, and choose how many years you wish to compare. 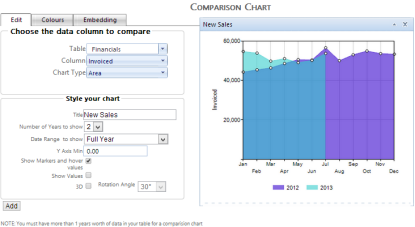 If you’re only comparing 2 years, a simple bar chart (3d or not),or an area chart may be the best suited for the task. However, for 3 or more years of comparison, consider using a line chart or a flat (non-3d) bar chart as this gives better overall visibility. You can choose whether or not you would like to display values on your chart, and in the Colours tab you can style the colours of your chart. Once you are done, click Add to add your new comparison chart to your dashboard. It doesn’t have to be any harder than that. Just remember that you have to have data that spans across more than one year in order for the comparison chart to work. As always, if you have questions for us here at Target Dashboard, let us know on support@targetdashboard.com. Or, check out our Dashboard Best Practice Guide for practical tips on using yearly comparison charts in performance management dashboards over time.